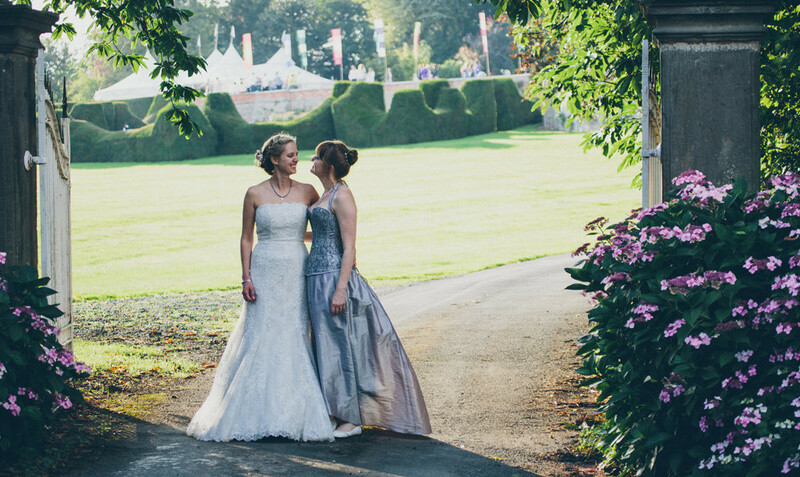 Nicola, a university lecturer, and Rachael, a GP, were married in the sunshine at the beautiful and historic Burton Court, near Leominster in Herefordshire on Saturday 5 September 2015. They had met four years previously and become friends. After a couple of years they realised that what they actually wanted was right there in front of them, each other! 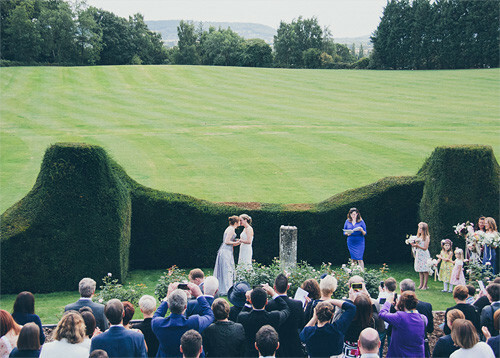 Nicola proposed to Rachael with a family ring (sapphire and diamond) over a champagne picnic in the grounds of Hanbury Hall, a beautiful National Trust property near their home in Worcestershire. They love being outdoors and opted for a camping/glamping weekend (their wedding favours were sporks and wildflower seeds!) 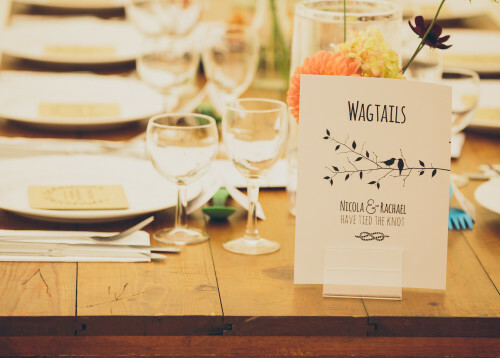 and drafted in the expertise of family and friends as much as they could to create a home grown, vintage style wedding with a relaxed feel. 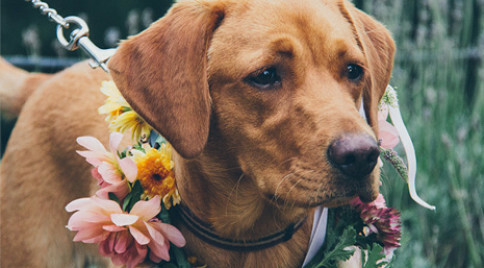 They tried to source as much as they could locally as well to make it a low impact wedding. They were keen for it to be a weekend affair and everybody was invited to the whole weekend from the Friday afternoon to Sunday morning. There was no specific colour scheme which might make some brides gasp! Rachael surprised herself (and everyone else!) and decided to wear something a bit more traditional. 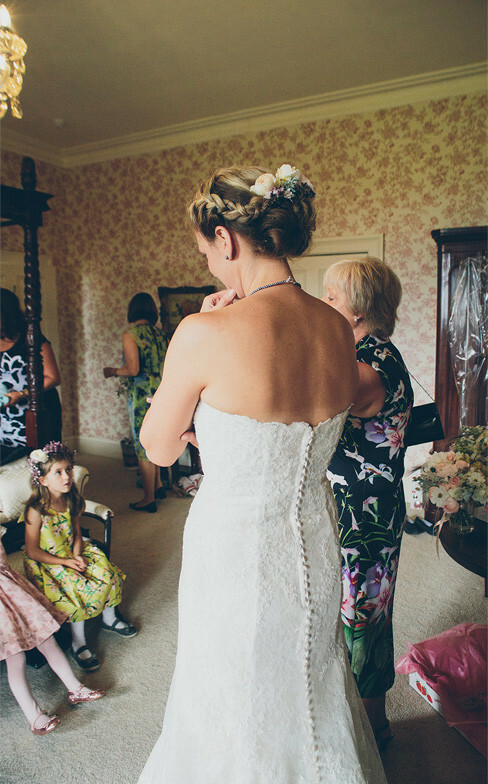 She wore a long, vintage-style dress with gold satin and two layers of white lace from 2 Have & 2 Hold in Kidderminster. Michael who owns the business was recommended by a family friend and despite his initial shock at the late shopping (4 months to go!) he got everything sorted without a fuss. Nicola wore a silver-lilac satin skirt and tailor-made corset by Lorraine at Booby Trapp corsets in Liverpool. Lorraine puts her life and soul into the corsets and can claim some famous customers! 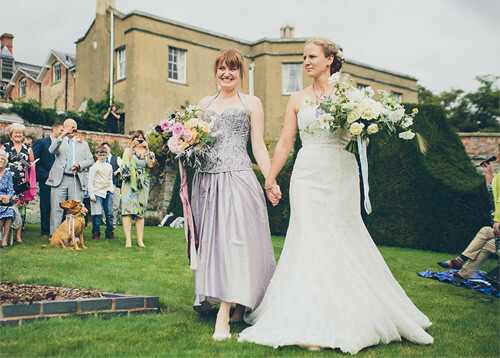 Following through with the summery, informal feel the two maids of honour, Rachael’s cousin Emma and Nicola’s best friend Jo, and their bridesmaids, Lucy, Isla and Sophie, wore their own dresses creating a lovely eclectic colour palette. 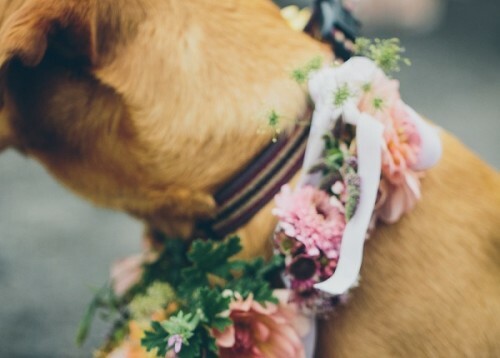 Rachael and Nicola’s 9 month old fox red Labrador was also a flower girl and wore a very fetching flower garland which lasted for a few hours before being eaten! On Friday night, those who were able to met up with the couple and their families at the Lion in Leintwardine for food (delicious homemade meat, fish and veggie pies) and drink to get the weekend going. Jessica, one of the managers, was fantastic is helping arrange things without a hitch. 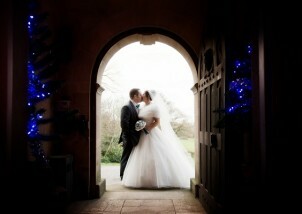 The wedding venue was the fabulous Burton Court. Despite their late booking and the plan to bring campers and glampers, Edward and Helen were wonderful and creative in helping plan the weekend. As Edward said, “If it is legal, we’ll try it!” Rachael and Nicola stayed for three nights in the gorgeous bridal suite. On the day, Edward was a perfect master of ceremonies, keeping track of the timings and making sure everybody and everything were all in the right place. 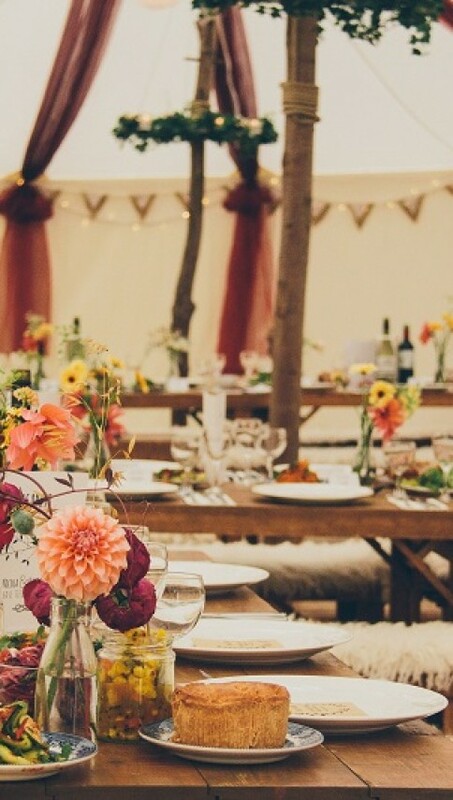 To accommodate the 150ish guests they had a unique medieval style marquee from local business Tents4Elements. 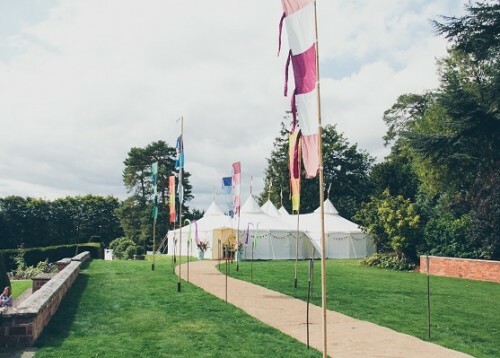 The marque looked amazing with the backdrop of the house and site visits by company owner Harry, made sure there were no unforeseen problems. To digest lunch guests were able to relax with a drink, play rounders, croquet or giant Jenga and for the kids there was a treasure hunt. After watching the sun setting on a gorgeous day, everybody headed inside to the atmospheric Great Hall for dancing to a set by family friend Becci from Lux Bay Duo and then Rachael cousin’s Richard did a DJ set. 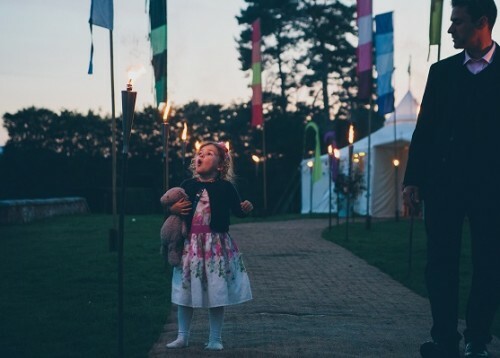 The mixing deck and lighting equipment were supplied by Wye Events. The area for campers and glampers was on the grounds of Burton Court. There was a fire pit in the middle surrounded by hay bales that had been kindly supplied by Helen’s brother, a local farmer. 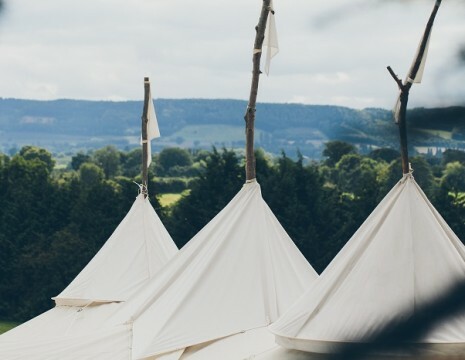 The glamping tents were supplied by The Tipi Hire Company and guests were able to book directly with them. For those who wanted to camp they pitched their own tent or brought their campervan, others stayed in local B&Bs. Facilities of showers and toilets were hired from Sitting Pretty in Knighton. 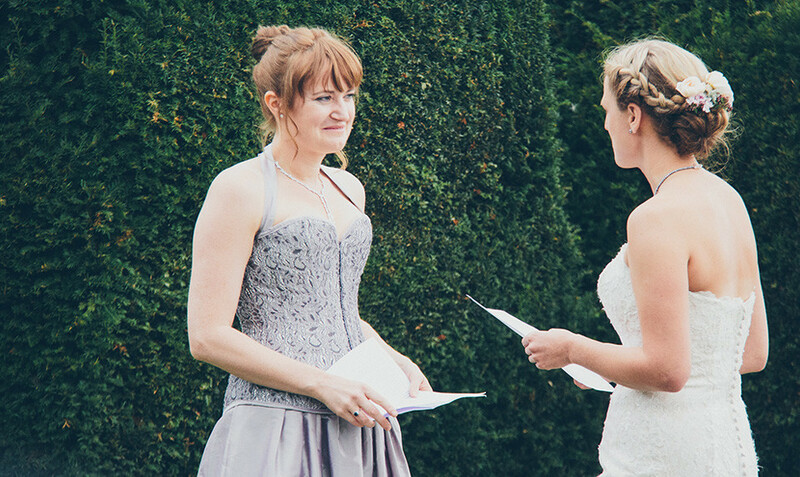 Rachael and Nicola had a civil ceremony in Hereford Town Hall the day before, with just their parents as witnesses. 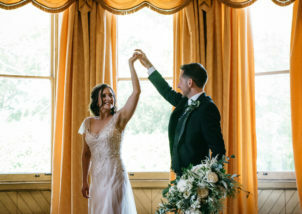 They were keen to design their own ceremony to declare their commitment in front of family and friends and did not want to have any restrictions on wording or content. 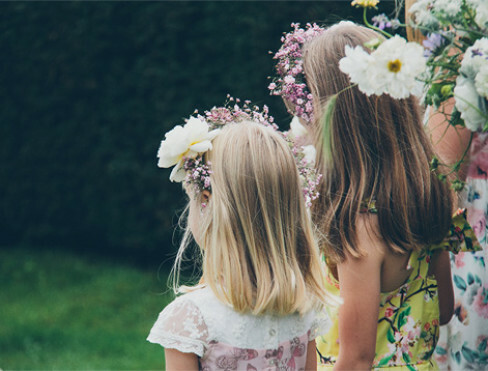 They both love nature and are spiritual without being religious and assembled a collection of music, poetry and rituals that were meaningful to them. 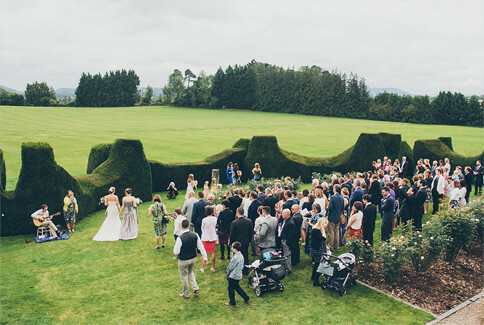 They held the ceremony in the evocative yew and rose garden at Burton Court, in front of the sundial. Going against tradition all their ushers were some of their closest female friends and sported rainbow pins so they could be identified! Their friend, Maddy, selected some crystals to place on the sundial. 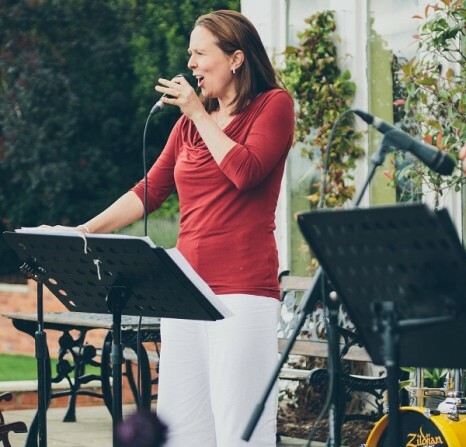 Rachael’s family friend, Becci from Lux Bay Duo, accompanied on guitar by Nicola’s brother, Jonathan, sang Etta James’ “At Last” as the arrival song and Ella Henderson’s “Yours” at the end. 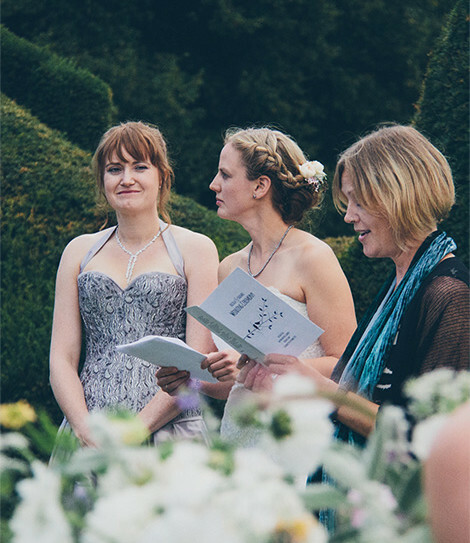 Their friend, Amy, ‘hosted’ the ceremony and Charlotte read Carol Ann Duffy’s poem, ‘Rings’ from The Bees. And Emma read an adaptation of Edward Monkton’s poem ‘A Lovely Love Story’. 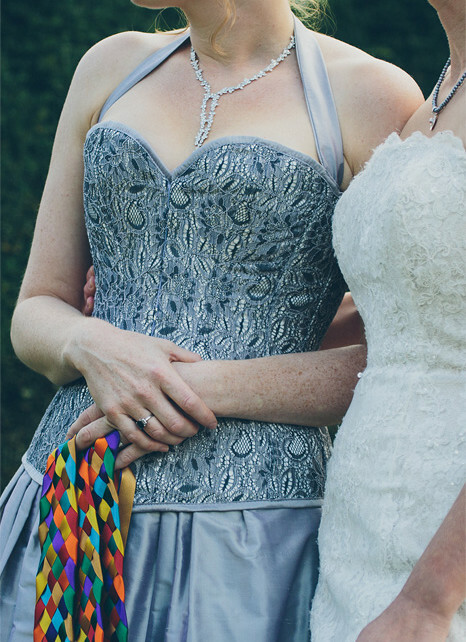 They exchanged rings designed for them by Emily Nixon, including some family diamonds of Nicola’s, and they used a pleated multi-coloured cord that they had made together for a handfasting ritual. 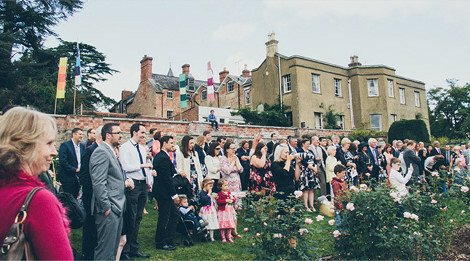 Burton Court arranged the essential summer Pimms and homemade lemonade drinks reception, with accompanying live jazz music, including vocals from Wendy Neiper. The food was provided by the Soul Food Project and went down very well with the guests and brides alike! Lunch was a spread of small plates, including pastries (Mushroom, Kale and Keen’s Cheddar Quiche, Courgette & Ricotta Tart, Pork Pies and Piccalilli), salads (Courgette, Chilli and Mint Salad, Seasonal Slaw, Beetroot and Crème Fraiche Salad, Tom Baker’s carrot salad) and homemade ciabatta rolls filled with Sliced Cured Meats; Emmental, Tapenade & Pickles; Smoked salmon, Sourcream, Horseradish & Beetroot; Roast Aubergine, Ezme & Rocket, and Hummus & Slaw. Throughout the eve, a real wood fired oven (brought on a trailer!) was kept stoked outside. In this there was Slow Cooked, Mechouia-Style Lamb, with Carrot & Cucumber Pickle, Mint Yoghurt & Flat Bread and a selection of pizzas, cooked to order. 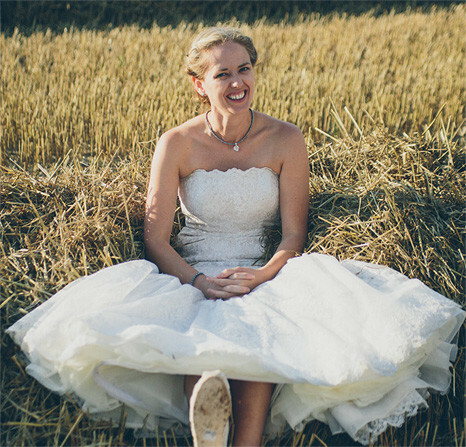 Instead of a traditional wedding cake, Rachael and Nicola asked their baking-inclined friends to bake a cake to bring , and they definitely stepped up to the challenge! 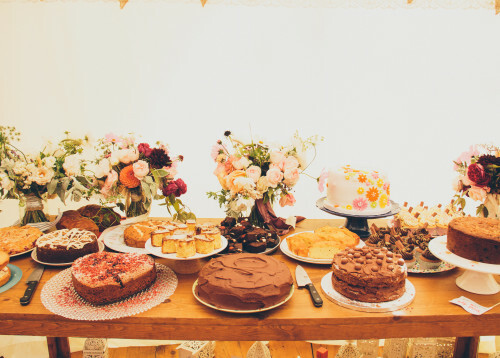 There was the most wonderful spread of cakes – from Nicola’s mum’s family-famous Torta Caprese, fairy cakes for the children, to pistachio cake and lemon drizzle. There were even nut-free and gluten-free cakes! 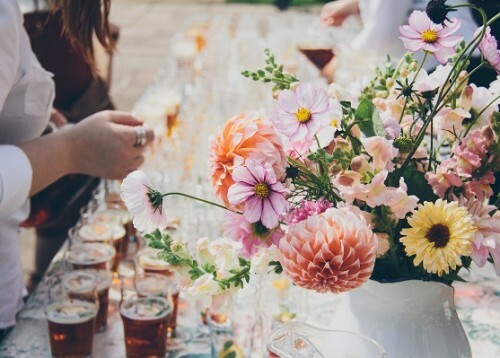 The wedding wouldn’t have been complete without fizz and ale – the couple’s favourite drinks. For the Wedding Toast the Classic Cuvee, from Three Choirs Vineyards, based close by in the Cotswolds was chosen. Although the couple love champagne and prosecco, they wanted to showcase the delicate, dry English sparking wines and the Classic Cuvee (80% Seyval Blanc and 20% Pinot Noir) is their favourite. For the ale, Butty Bach (4.5%) from the Wye Valley Brewery, in Herefordshire was chosen. Meaning “little friend”, this full bodied ale brewed using Maris Otter and Crystal malts, flaked barley, malted wheat and locally grown Fuggles, Goldings and Bramling Cross hops. 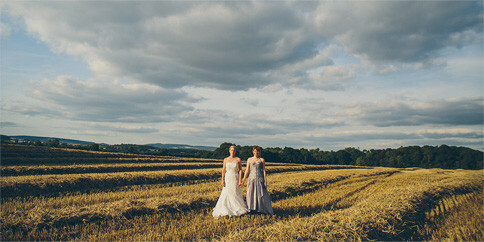 Rachael and Nicola’s photographer was Jessica Withey, a new talent from Hereford. 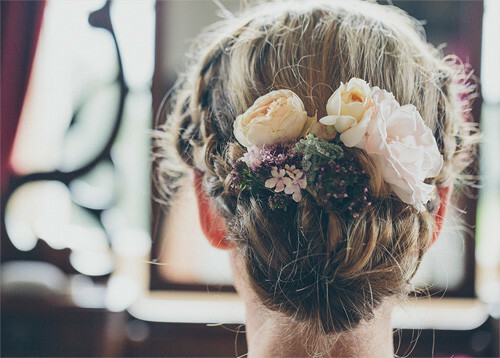 The photos on this page are all hers and the couple were drawn to her unique, vintage style and her warm, friendly personality. 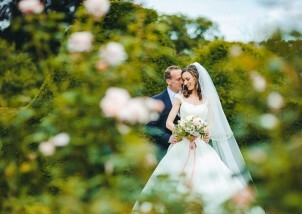 She, and her assistant, were completely unobtrusive on the day and caught the mood and atmosphere perfectly. Jess’ career is now taking off and she also does high end fashion photography.